I haven’t been out of the country for a while, so I decided to visit my “International Quilts” tub upstairs under my guest bed. 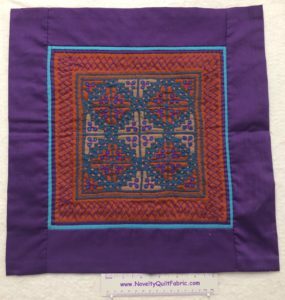 Once again, I was delighted to see the small Hmong quilts that I have been fortunate enough to collect. As I pulled out several of them to photograph, I was amazed at the tiny little stitches. I had to photograph them with a small 6” ruler below so you could get a sense of their size and how very special the embroidery work really is. I love the way they have combined royal blue with brown and lavender. There is no batting in this piece but there are tiny, tiny French knots in all the little brown arches in the middle. It is such amazing fine work. This second piece was never joined to a back. 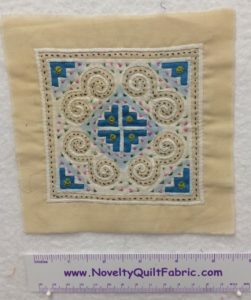 It looks like rather than doing a French knot they made almost a quilting stitch in the narrow channels of white arches. It is done with blue thread, so it really features the stitch. The outer skinny white border is appliqued on rather than pieced in. I would guess the only way you can do that is with very thin fabric. I certainly wouldn’t be able to manipulate a Kona cotton to fold that small. 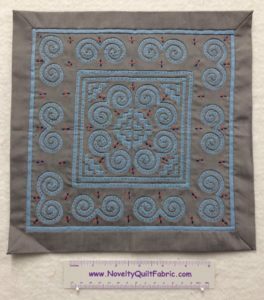 This third one is a little larger (15” x 15.5”) and on this one they have pieced the light blue outer border with a very narrow purple one before attaching them to the inner copper colored fabric. Some of the inner fabrics are still appliqued and/or reverse appliqued. 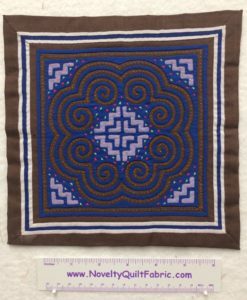 This piece also has a great variety of embroidery stitches applied to it. I love the color choices used here. Combining copper, blue and purple with a little teal and beige just makes the combination sing. The last one I have to share is pale blue and gray with embroidery threads of dark blue and orange. The arches are stitched in dark blue. It is another stunning example of reverse applique.